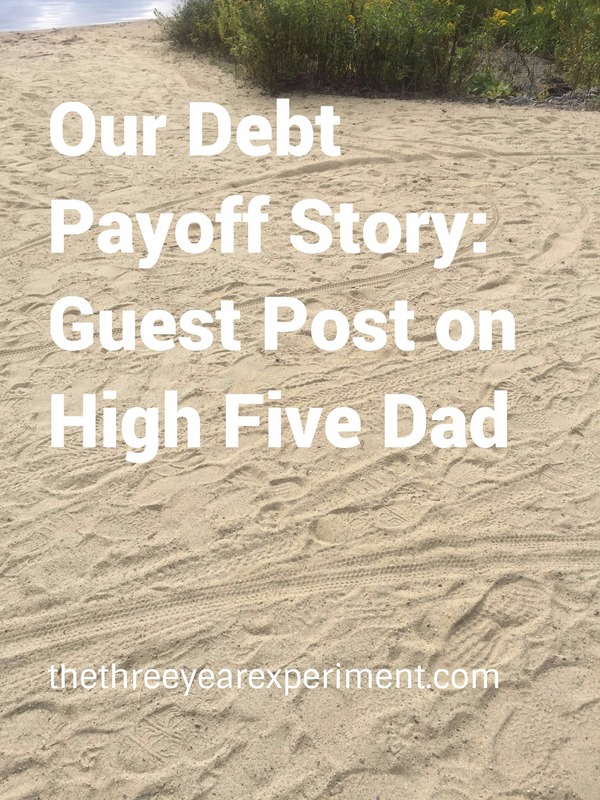 I’ve written about our debt payoff before, but today I typed up all the gory particulars for a guest post on High Five Dad. High Five Dad is a blogger who shares lots of debt payoff stories from people of all walks of life, to show you how different people achieve a similar goal. Debt is pernicious, but when I first married Mr. ThreeYear, I thought it was normal. We thought we were on the right financial track because we were saving for retirement and investing, even though we had a $10,000 credit card balance and car loans. Mr. ThreeYear and I started out our lives together debt free, thanks to our generous parents and our savings skills while we lived in Chile (Mr. ThreeYear even bought his first two cars outright with cash). Unfortunately, once we moved to the spendy, show-offy land of Atlanta, we changed our ways for the worse and racked up a lot of debt. Find out what made us decide to get rid of our debt for good and how we paid if off in 18 months over at High Five Dad. Thanks so much for including our story, High Five Dad!! If you can leave a comment here or there, letting us know what you think or how your payoff story compares, I would really appreciate it! And stay tuned for another regularly-scheduled blog post on Friday!